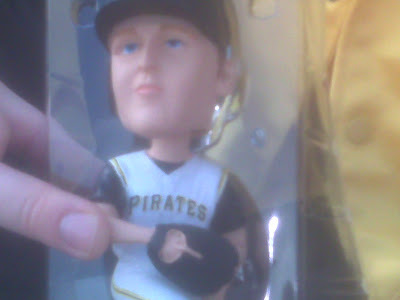 In a somewhat stunning move, Pirates pitcher Tom Gorzelanny, shown above in graphic bobblehead detail, has been sent to Triple-A Indianapolis. The demotion of Gorzelanny means righthanders Ross Ohlendorf, Virgil Vasquez and Jeff Karstens are left to battle for the final two rotation spots, eventually joining lefties Zach Duke and Paul Maholm and righty Ian Snell. It's not quite Maddux, Glavine, and Smoltz, but we'll take what we can get. The fall of Gorzelanny has been hard and fast. Following a 14-10, 3.88 ERA, 201 innings season in 2007, those same numbers slipped to 6-9, 6.66 and 105 innings in 2008. In four starts and nine innings this spring, Gorzelanny had a 7.00 ERA, allowing eight hits and walking five batters. Chalk this up to the Pirates following through on their "accountability" threats that have previously claimed the Pirate careers of Matt Morris and Ronny Paulino. In other news, the Pirates also sent highly-regarded OF Jose Tabata to Double-A Altoona. Tabata, the centerpiece of the trade with the Yankees last summer, hit .407 with five RBI in 11 games this spring. Isn't Ian Oquendo a righty? I always know when it's Pirate season, I always lose one of my radio stations.